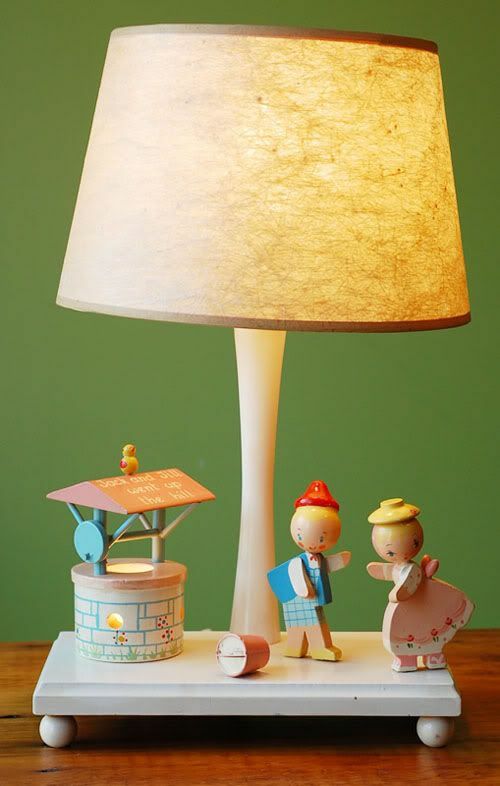 Vintage Storybook Lamps, Anyone? The World of Irmi. Soooo cute, right? The little boy playing the guitar while the little girl is knitting? Amazing! (By the way, that little white blob that looks like those rock things people use in curling is actually a kitten. And yes, this is a photo from Dottie’s little girl’s nursery. SO perfect!) I love it. I know some folks think these lamps can veer on the kitschy side (*gasp! *) but I find their storybook style super duper charming. Yes the little well on that last one (Jack & Jill, doncha know) lights up! I’m pleased to tell you that these little treasures have a name. And maybe you already knew this (to which I say, “How come you never told me? ?” hee). Irmi Nursery Originals. Remember this people, as there will be a quiz later. 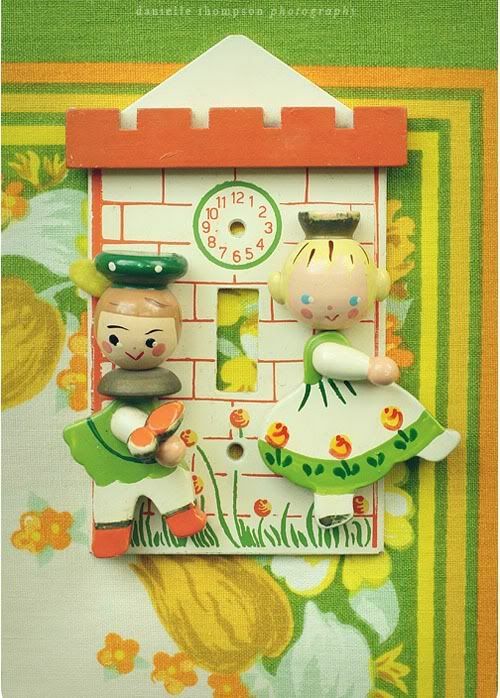 The creators of these whimsical treats were a lovely German couple named Fred and Irmi Bering. 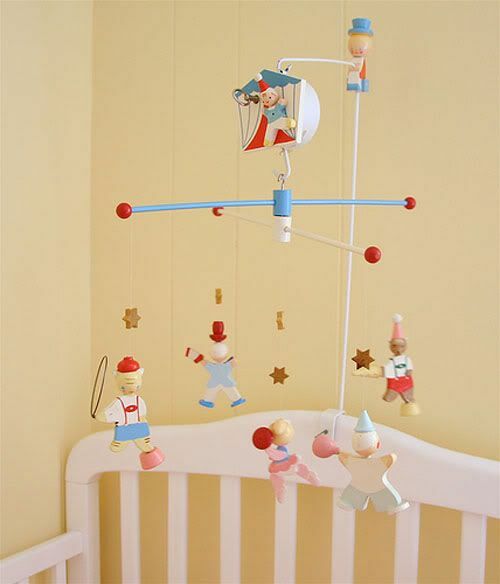 In addition to hand-painted wooden lamps they made wall hangings, light switch plates, nursery mobiles and more. They were produced in the 1950s thru 1971 (when they sold the company). 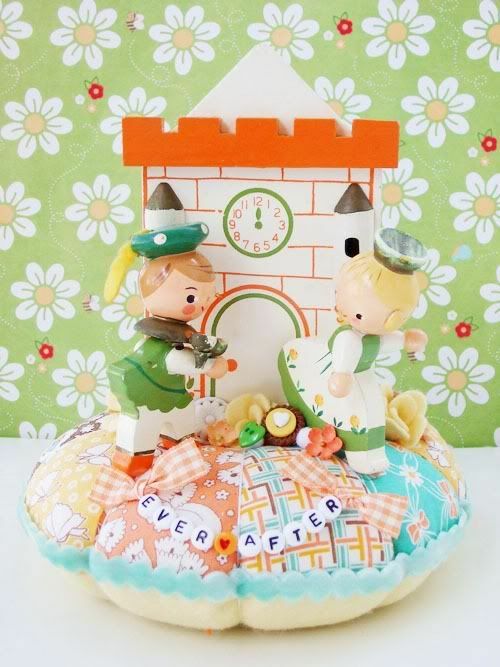 The characters are often taken straight from the pages of nursery rhymes or fairytales and each lamp usually offers a little extra bonus—a music box, a little additional “light up” feature etc. Fred and Irmi were generous spirits and in 2004 donated $2 million to Danbury hospital. You can read a bit more about their story here. I’m sorry, but animals with hats are simply the best thing EVER. Yes, that little guys are wearing LEDERHOSEN! Sweet! Are you dying yet? I can’t even begin to tell you how hard it was to just pick a few of these. The good news is, you can snap up your own on ebay or Etsy. Simply search for….what was that name again class? “IRMI!” Bravo! Modern Kiddo Buying Tips: These lamps typically sell for $20-60. If you’re paying $65+ it better be in pristine condition OR crazy cute (aka I wanna see at least TWO giraffe’s wearing top hats, mmkay?). Don’t be scared off by an ugly lamp shade. Many will have lost their original shades, and buying a new one (or embellishing it with pom poms or ric-a-rack) is pretty easy! 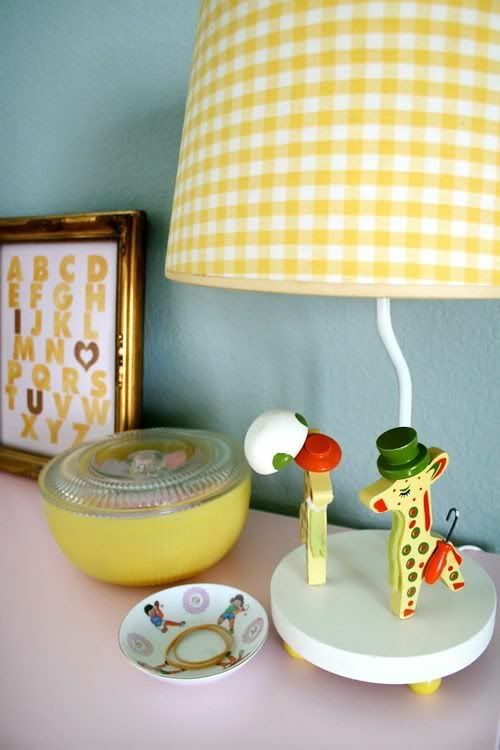 Don’t forget, not everyone knows they are called “Irmi” lamps, so get creative and search for “Nursery Originals” “Nursery Plastics” “Vintage Wooden Lamp” etc. when browsing ebay/etsy! Happy hunting! 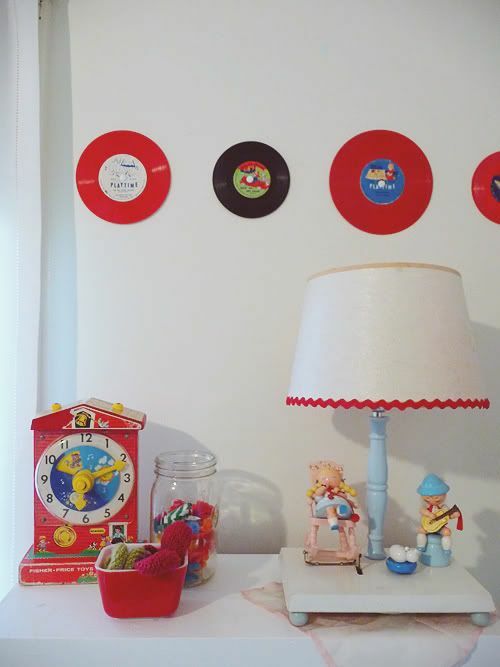 Posted in Best of Alix, Kiddo Rooms, Vintage Childhood, Vintage Toys + Fun Stuff. Tagged with Irmi, Lamps, Nursery Originals, Vintage Lamps. i still have the one from my nursery in Pip’s room! it is a little train with a dog in….yes…a hat and he plays music when you wind him up! heather, you have the coolest stuff! These things are adorable–I love the cowboy. I remember these from my childhood! I think they are precious. woah! i got one of these for tru’s room, it’s the jack and jill one and i think i paid something like 2 bucks! thanks for the info, now i am off to spend a mint on other items as i LOVE THESE. i dunno if you ever watch “super why” on PBS but the storybook part where they go into the story is in this style, i don’t even know what it would be called? the whole bloc shapey pastel thing, and i just love it!! irmi irmi irmi la la la la squirmy! oh, and the fact that the jack and jill well lights up for a night lite slays me. I gotta say, I love mine something fierce! As a knitter, getting the knitting mama was particularly fun! And you wind up the kitty to play music! I also have the mobile too! I LOVE IRMI!!!! $2 is the perfect price Lishy!! and heather, why am I not surprised that La Pip has one of these in her room too?? Those are amazing! I remember my girlfriend had one growing up- I thought it was the sweetest thing in the world, and I wanted it. Thanks for the reminder… Stella might be getting one for her room now! 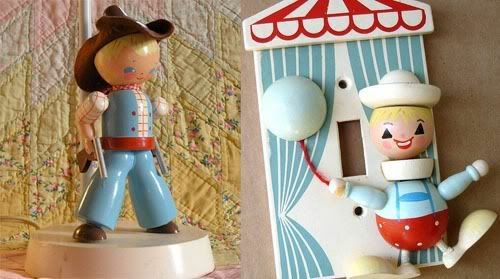 I sort of remember these, but I totally had that wind up clock toy in the first picture. It was one of my faves. Beautiful Pictures, each one made me smile! The little cowgirl reminds me of the past and present. I think of Jessie from Toy Story when I see her, thanks! I bought half of my nursery accessories from Sweet Lily! (My lamp for Henry’s room is the little boy with the fishing pole posted in one of your pictures!). Love her stuff! Just aquired the irmi Giraffe Clothes horse/rack. I thought it huge when I saw it in my brothers room as a kid. It was great fun to see and buy it at a garage sale. I am trying to find out some information about a music box given to me by my Great Grandmother who died 2 months before I was born, in 1971. It is Snow White and the Seven Dwarfs, it plays (oddly) “when you wish upon a star”. It is Snow White in the middle with the seven dwarfs in a circle around her. It says “Original by “IRMI”” and “Nursery Plastics Inc” on the bottom. While I have found some information about the maker and I have seen of the toys made…I have seen nothing about this music box. Any help would be GREATLY appreciated. Thanks! Hi there! 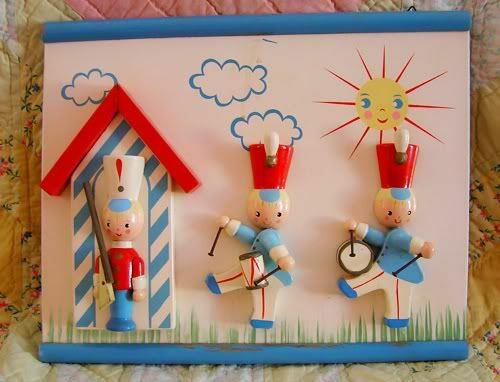 How cool about your music box I would love to see a photo….sounds like you DO have an original Irmi music box. have you clicked on the link included in this post? It might answer some of your questions! it goes into further detail than we do…. Hi Alix. No, I do not see a link such as you describe (forgive me if I am overlooking it). I am not sure how to send you a picture of this music box, either. If you would be interested in a picture, or if you could help me further: I would be so very grateful. Thank you! I’m not quite sure what kind of info you are looking for and I don’t think I could really tell you too much than what we’ve already shared. 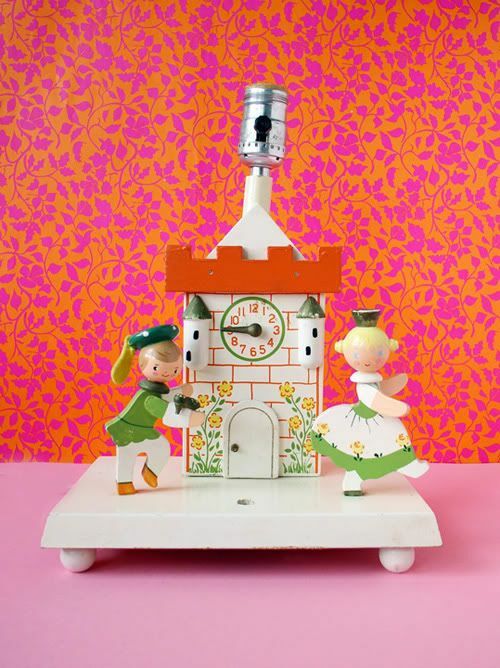 If the music box is labeled “Irmi” you most definitely have a Snow White Irmi Music Box, that was probably made in the 50s or 60s. 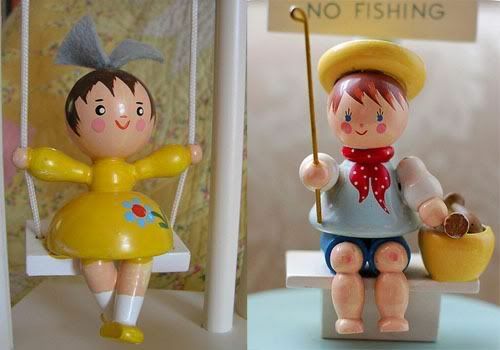 They were based on storybook characters and nursery rhymes and were a def trend back in the day for children’s rooms. They are growing in popularity amongst vintage collectors—although I wouldn’t say they have a high price tag just yet. It’s more the nostalgia and charm. There isn’t much known about the company, unfortunately (or rather not much info is available online). This woman talk a little bit more about the family who produced the lamps and has a photos of your Snow White music box. Good luck with your fun music box! It sounds like a lovely piece of vintage history! My grandmother bought me a Irmi lamp at a yard sale when I was about 6. I had the S.S. Owl lamp. I loved going to bed listening to the musical song the lamp came with. Until teenhood hit, and well, I was too “grownup” how could I keep it around?? I don’t know what happened to it honestly, but I miss it. I am 24 years old with a son of 6 1/2 and how I wish I had the lamp for him. I googled it and found a picture, clicked on it, and now I know where to get one! I am glad I came across this article and I am so happy I know NOW the history of these lovely lamps. I have an Irmi ’59 giraffe clothing rack from my childhood if anyone is interested. 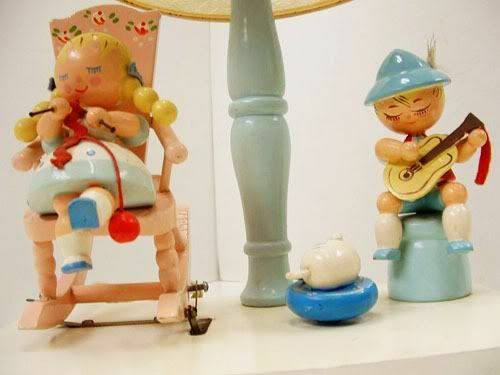 I grew up with a lovely Irmi lamp that had a music box with a girl sitting at a piano. My recollection is that you wound the music box by turning a wooden bluebird. I always love that lamp. We also had a Jack and Jill switch plate. I used to have one of those music box lamps in my nursery. My mother reminded me of the time when I reached over my crib and pushed the lamp off of the dresser. My father was able to mend the lamp back together, except the music box never played again:( I found a similar lamp at an estate sale several years ago in very good cosmetic condition, however the music box is inoperable. The music box was manufactured by Swisstone of New York City. I know this was posted quite a long time ago but I have a question for you considering you have an interest in Irmi products and are a self-proclaimed vintage expert as well! I came across this Irmi wooden chair/step stool and want to restore it to it’s original graphic, however it is worn and for the life of me I cannot find a match anywhere online to reference. If i send you a picture, do you think you would be able to help me out? Thank You! I have the same problem. 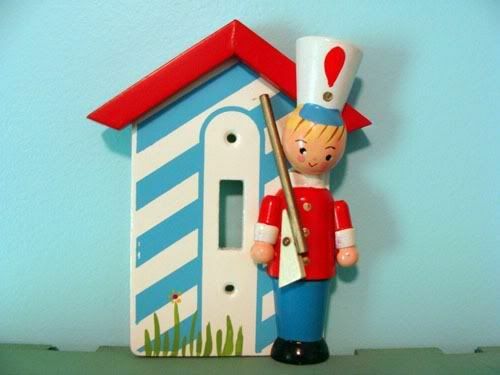 I was given one of these when I was a baby and still have it (I’m 56 now). I’ve found a few photos online, some of which actually show the step stool in pristine condition. What I need is more information of IRMI, and thanks to this wonderful page, I have it. As for the step stool, try Googling “IRMI carousel step stool” and go to images. You should find quite a few. I hope this helps. i just bought an irmi crib mobile from ebay (the fairytale style) and i tested it for lead using a swab lead testing kit yesterday and the results were positive for lead. this made me very sad because it was just so adorable. i wonder why people still use this? is there something i am missing? My in-laws just gave us an Irmi mobile so I was wondering if the paint had lead in it so I started looking around and found your posting. I know it has been almost a year since you posted this but I would like to know more about your testing.